Over the last few weeks, we have had numerous calls from homeowners and growers wondering why their basil is turning yellow and defoliating. The reason in most cases is downy mildew. 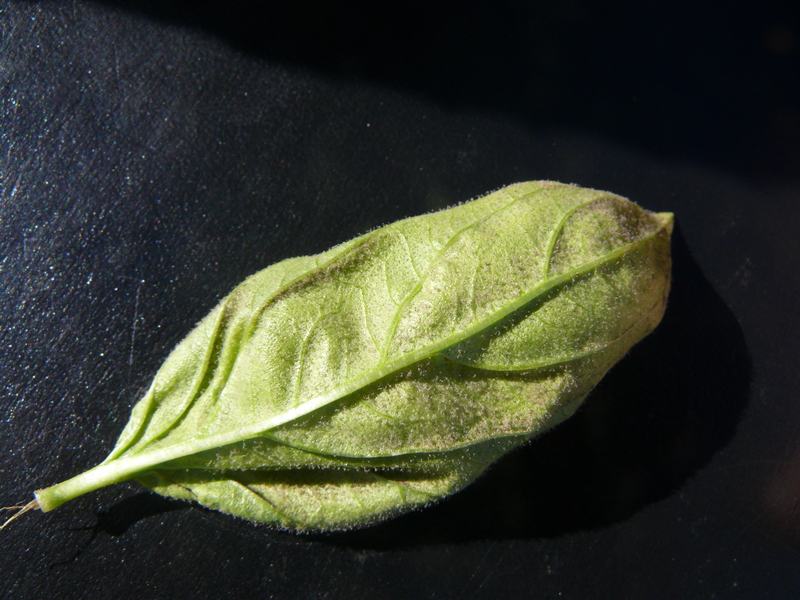 Basil downy mildew seems to be particularly common this summer, likely due to the rainy weather and the fact that the disease first appeared in the field in mid-July rather than August which has been more typical. 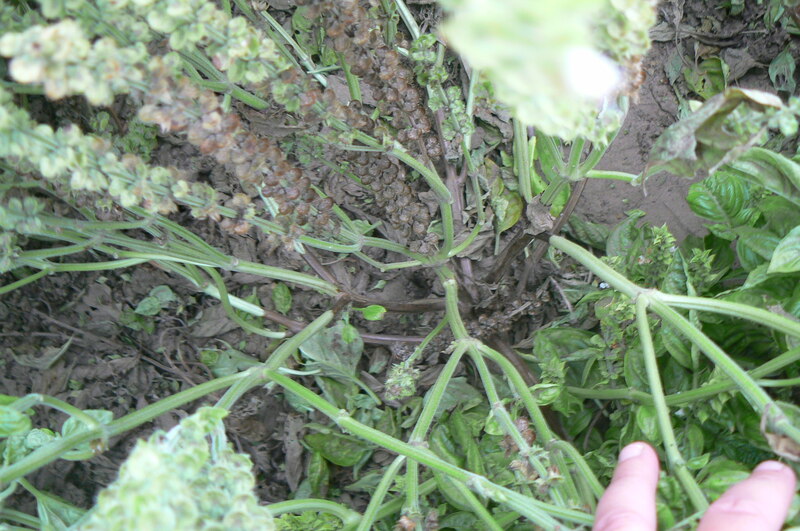 In Ontario, the fungicides cyazofamid (Ranman and Torrent), mandipropamid (Revus) and phosphorous acid (Confine) are registered for control of downy mildew in commercial field basil. All of these products are preventative, and will have limited effect on the disease once symptoms are widespread in the field. It is important for growers to also be aware that once leaves are infected with downy mildew, it takes at least a week for symptoms to develop. Consequently, seemingly healthy leaves at harvest may develop symptoms post-harvest. This is not an issue for dried basil, as long as drying occurs as soon as possible after harvest. Research to date has not identified any organically acceptable products that are effective against this disease, nor are any currently registered in Canada. 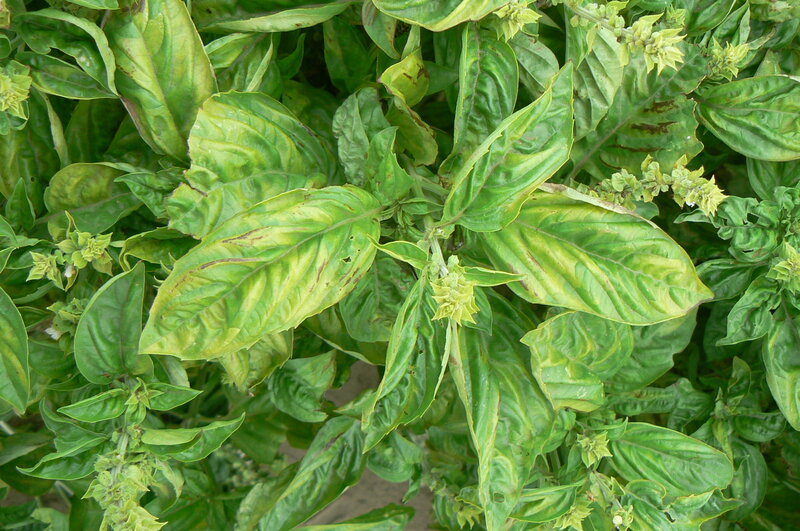 Basil downy mildew causes yellowing, or chlorosis, initially within the leaf veins, on the upper surface of leaves, and purplish, fuzzy growth on the leaf underside. Symptoms often start on the lower leaves and move up the plant, causing defoliation from the bottom up. Downy mildew symptoms often progress upwards from the bottom of the plant. This entry was posted in Culinary, Herbs and tagged Basil, culinary herb, Diseases, Downy Mildew. Bookmark the permalink. Best results with REVUS fungicide if you use a spreader like Agral 90. Translaminar and very rainfast but you need the spread.